The Cherokee Indians who later inhabited these mountains have a legend that says the stone wall was constructed by a race of “moon-eyed” people. They also said that these people were nocturnal and lived underground, only coming out at night. These people were supposedly tall, light-skinned and had beards. Could there be any truth to such legends? Archaeologists have noted that the Hitchiti language was once widespread throughout Georgia due to the number of place names in the state that are of Hitchiti origin. 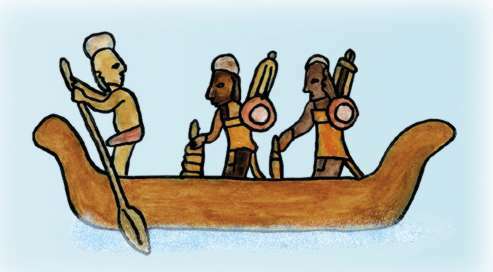 When the first Spanish explorers entered this region in the early 1500s they encountered many Hitchiti-speaking tribes. These tribes were described as being tall and wearing mustaches and turbans. The chiefs wore full beards. (One such chief from a town called Ocute had a beard that, according to Spanish accounts, reached his belly button.) Thus the idea that tall, bearded people constructed the Fort Mountain wall isn’t completely out of the question. But what of the ‘nocturnal, subterranean-dwelling’ aspects of the legend? 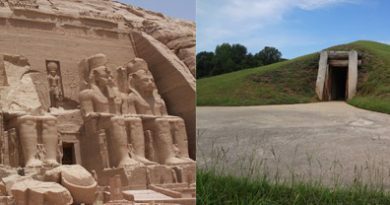 Once again, Spanish records indicate they encountered Hitchiti-speaking tribes living in “hollow’d mounds…fully covered in mud.” These mounds are likely identical to the earth lodge discovered at Ocmulgee Mounds in Macon, Georgia– a site also constructed by Hitchiti-speaking Native Americans. From the outside an earth lodge appears to be a mound of earth yet it is, in reality, a sophisticated structure covered in earth usually reserved for ritual or ceremonial purposes and likely the residence of a chief or priest (who would have been bearded.) Thus this seemingly bizarre part of the legend, subterranean dwellers, now has a plausible explanation as people who lived in earth lodges. 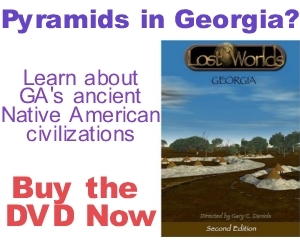 Video still from the DVD “Lost Worlds: Georgia” showing a section of the stone wall. 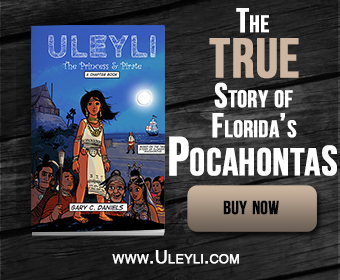 The Spanish gave these natives the derogatory name “micos sucios” which translates as “dirty monkeys.” This has been conjectured to be the origins of the tribal name Miccosukee, one of the few Hitchiti-speaking tribes remaining in America (currently residing in south Florida.). 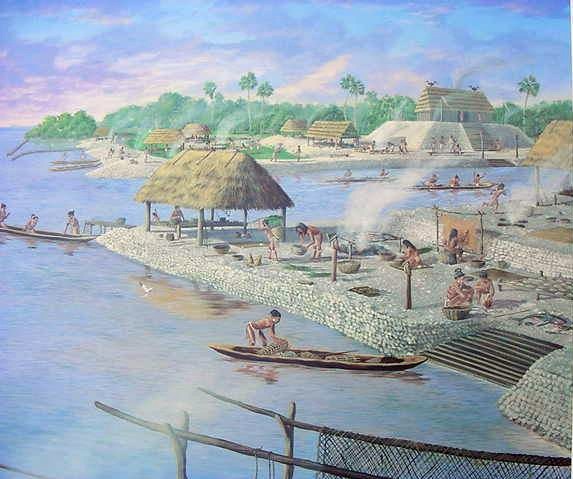 The Miccosukee were, in reality, part of a tribe known as the Chiaha, who were located in the mountains of Tennessee and Georgia. 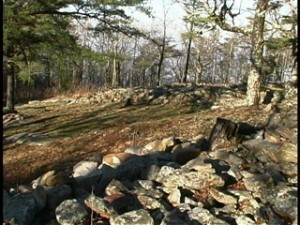 Thus it is likely that they are the tribe responsible for the construction of Fort Mountain. Since we’ve established that the Cherokee legend is likely an accurate description of the people who built Fort Mountain, we can deduce one final important piece of the puzzle. The legend states they were nocturnal which suggests they spent their nights on Fort Mountain observing the stars and performing ceremonies. Thus the astronomical interpretation of this site is likely an accurate one. 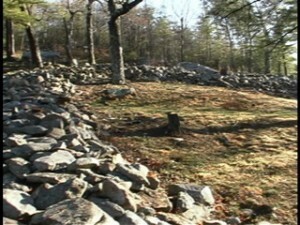 Another video still from the DVD “Lost Worlds: Georgia” showing a section of the stone wall. Hitchiti-speaking tribe, likely the Chiaha. As priests they would have worn long beards. They would have spent their nights observing the stars and moon, and eventually noticed the strange motions of certain stars that we know today as planets. The brightest and most beautiful of these stars/planets were Venus and Mercury and so they built a monument in stone that reflected the path these bright objects took across the pre-dawn sky. 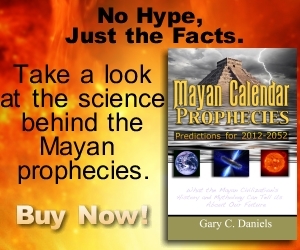 These astronomer-priests then returned to their earth lodges during the day to sleep. Since they would not have gotten much sun they would naturally be a lighter complexion than Native Americans who spent their days in the sun. Outsiders who witnessed these priests would tell stories of how tall, fair-skinned, bearded people who lived underground and only came out at night constructed the rock wall at the top of Fort Mountain.